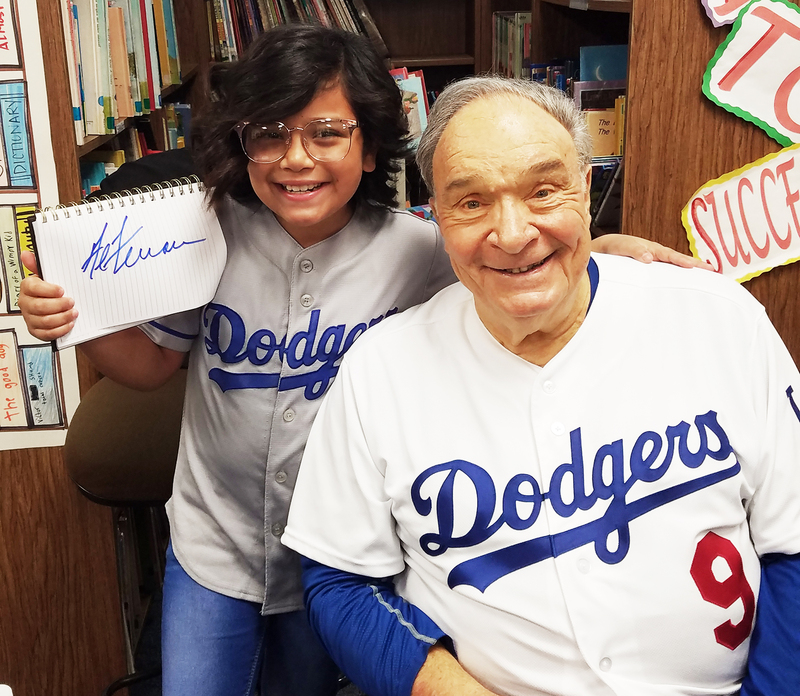 EL MONTE – New Lexington School fourth-grader Arcyruby Sanchez says hearing Los Angeles Dodger great Al “The Bull” Ferrara talk about the importance of education has encouraged her to devour as many books as possible during her school’s upcoming Reading Rocks Challenge. 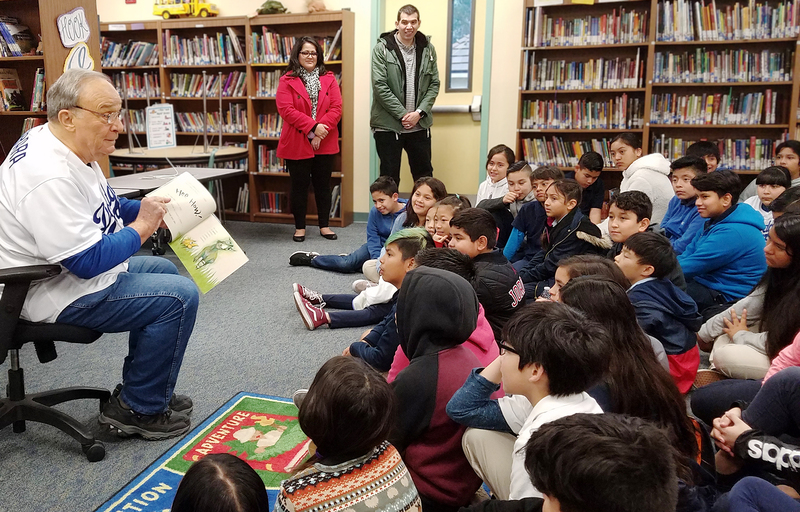 Ferrara, a Major League Baseball player from 1963 to 1971, read “The Wonky Donkey” at several New Lexington assemblies, encouraging students to improve their reading and go to college. As part of the challenge, New Lexington students will gather donations for each book read through Feb. 22. Donations fund fieldtrips and other special activities. Ferrara said his reading skills at age 7 helped him win tickets for his first baseball game – which also happened to be Jackie Robinson’s historic first Major League game. The Reading Rocks Challenge is part of a District-wide initiative to improve student literacy created by Superintendent Dr. Maribel Garcia. Reading events will occur across the District through March. EMCSD_READING1: New Lexington School fourth-grader Arcyruby Sanchez shows off an autograph from former Los Angeles Dodger Al “The Bull” Ferrara, who encouraged students to read and attend college. EMCSD_READING2: Los Angeles Dodger great Al “The Bull” Ferrara visited New Lexington School to read “The Wonky Donkey” and encourage students to become avid readers. New Lexington School fourth-grader Arcyruby Sanchez shows off an autograph from former Los Angeles Dodger Al “The Bull” Ferrara, who encouraged students to read and attend college. 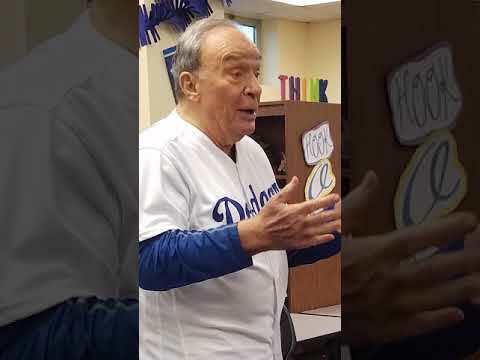 Los Angeles Dodger great Al “The Bull” Ferrara visited New Lexington School to read “The Wonky Donkey” and encourage students to become avid readers.